The brief, Preventing nutrient loss and waste across the food system: Policy actions for high-quality diets, points out that poor-quality diets are now a greater public health threat than malaria, tuberculosis or measles. Meanwhile, approximately one third of all the food produced for human consumption never reaches the consumer’s plate or bowl. The brief was prepared by the Global Panel on Agriculture and Food Systems for Nutrition in partnership with the Food and Agriculture Organization of the United Nations (FAO). It notes how foods such as fruits, vegetables, seeds, nuts, dairy products, meats and seafood are rich in nutrients, but are also highly perishable and therefore susceptible to losses throughout the food system. The numbers are staggering: each year more than half of all the fruits and vegetables produced globally are lost or wasted. A vital source of protein, around 25 percent of all the meat produced – equivalent to 75 million cows – is not consumed. The brief proposes a series of policy actions across the entire food system, including: educating stakeholders; focusing on perishable foods; improving public and private infrastructure; encouraging innovation; and closing the data and knowledge gaps on food losses and waste. Panel member and President of the Public Health Foundation of India (PHFI), Prof. Srinath K. Reddy,welcomed the brief, saying: “The Global Panel’s policy actions show how reducing food loss and waste could play a key role in improving the poor and inadequate diets that affect 3 billion people globally, and which are often responsible for persistent undernutrition, and also the rise of overweight and obesity and the associated increase in non-communicable diseases”. The brief also examines the many ways in which food loss and waste occur across the food system – from agricultural production to processing and packaging, storage, transportation, retail, and through to people’s own kitchens. Adopting a broad approach is critical because so much loss and waste occurs beyond the farm gate. 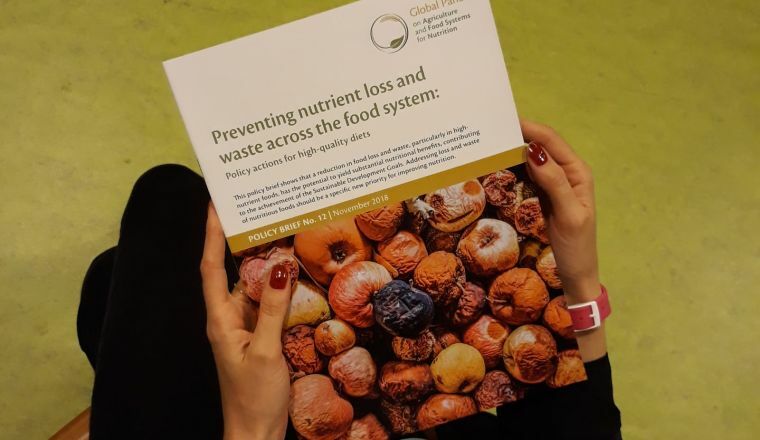 Drawing on the latest evidence, the brief concludes by setting out six key priorities for action to reduce loss and waste of nutrient-rich foods. It also provides diverse examples of existing initiatives and potential innovations to guide action in both the public and private sectors. It would also deliver economic returns, as the value of food lost or wasted annually at the global level is estimated at $ 1 trillion. Eating more of the food already produced would also avoid the waste of the water, land and energy that went into its production.